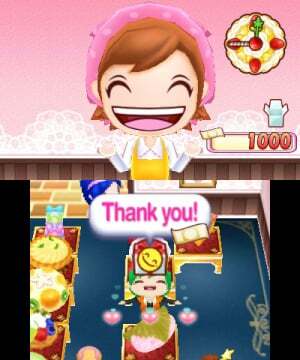 Of all the heroes of the DS’ Touch Generations era, Office Create’s Cooking Mama has been one of the most enduring — and prolific. Starting out from her humble beginnings as a short-order chef, using quick WarioWare-style touchscreen minigames to simulate the in-kitchen experience, she’s expanded her empire to gardening, arts and crafts, and even childcare. After several DS installments and Cooking Mama 4 and 5 on the 3DS, she’s back for one last hurrah on Nintendo’s stereoscopic wonder with Cooking Mama: Sweet Shop. 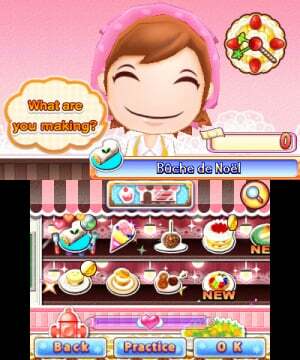 Though it’s not as complete a package as Cooking Mama 5, and its lack of challenge will keep plenty of players away, the spotlight on sweets is a great fit, and sugar fiends and younger players will have a great time helping Mama out in the kitchen. Though there are several modes to choose from when you first step into the kitchen, the main stage of Sweet Shop is the excitingly-named 'Let's Make Sweets! ', where you'll set to work making any of the 60 mouthwatering delicacies Mama's prepared to teach you. Crêpes, pancakes, chocolate truffles, fruit tarts, cream puffs, cakes, pies, Swiss rolls, and many, many more are among the early options, and completing recipes will unlock more, so there's a good sense of progression running through your rough puff rolling. Once you pick a treat to make, Cooking Mama's classic gameplay template kicks into gear: you'll move through the recipe step-by-step, where each step takes the form of a touch-, gyroscope-, or microphone-based microgame that mirrors the real-world work required. To make Cream Puffs, for example, you'll first have to sift out flour (with gentle taps on the sieve), then boil the mixture (adding ingredients by dragging and adjusting the heat at intervals), pour while mixing (stirring with stylus circles and stopping at the correct times), squeeze the dough onto a tray (holding down the stylus until the dollop is the right size), set the oven (memorizing and inputting the temperature setting), cut the puffs in half (with a quick flick of the stylus), and finally fill them with whipped cream (by tracing concentrically smaller circles with a steady hand). Each of these steps is scored and timed — very generously — and you’ll receive a medal at the end for your efforts. 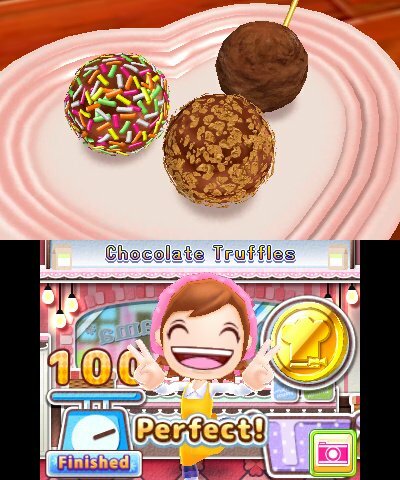 Even though there’s never very much pressure it really is a winning formula for fun; the Cooking Mama experience is an intoxicating mix of comforting calm and simple stylus actions that makes for a genuinely great time. Mama's bakery isn't all by the book, either; at the end of most dishes you'll be able to decorate to your heart's content, in 360° and without time limits, and you can make some beautiful personalized creations here. Even better, and in one of our favourite additions to Sweet Shop, after decorating you'll have the option to pop your pastry, pie, or cream puffs into the photo studio for some up-close food photography. It's surprisingly addicting to find the best angle to show off your work, and unlocking new backgrounds, borders and decorations as we played really kept us going — we even found ourselves going back to previous dishes just to take more pictures with our fancy new photo borders. Some of the challenges in this installment enjoy a bit of additional excitement thanks to some questionable decisions from Mama — we’re not sure why she’s decided to have players sprinkle powdered sugar on a sponge near an open window on a gale-force day, or cut strawberry tops off as they roll downhill rather than simply holding them still, but the extra thrill is almost always appreciated. Occasionally these cross over from fun to frustration, especially in the few microgames where it feels like Mama is actively working against you — as when you help guide a pan on the way to the oven by tapping at each of Mama’s hands as she is, as far as we can tell, just trying to fling it across the room. For the most part, however, individual components of the recipes are fun and easy, and after you make a few sweets you’ll start to see some familiar games pop up again and again. That’s not a negative at all; rather, it gives a wonderful sense of progress as you play. You’ll have to learn just how to slice your sponges the first time it comes up, for instance, but by the third or fourth cake you make it will feel like second nature, and that in turn makes it feel like you’re really learning how to bake — in Mama’s world, at least. That's relatively easy to do, too, as Cooking Mama's stylus-based controls are responsive and easy to grasp, so even younger gamers should be able to tap and swipe with the best of them straight away. The only issues are with a few inconsistent symbol prompts — sometimes the indicated direction of a circle matters (as when spreading crêpes) and other times it doesn't (mixing batter) — and with decorating, where the drag-and-drop touch controls seem to require significantly more force than normal. Even with those hiccups, however, Mama's eternal optimism keeps things nice and forgiving; more than once we slopped batter all over Mama's face, sent our carefully separated eggs flying across the room, or dusted the entire house with flour, and each time Mama rewarded us with a thumbs up, “You can do it!”, and a still-decent grade. Even better, and in keeping with Mama's all-ages appeal, mistakes aren't just forgiven, they also come with fun, on-theme fixes. Splattering batter all over the place triggers a game-within-a-microgame where you'll use a cloth to wipe down the kitchen, for instance, while spilling flour prompted us to blow into the mic to dust down the counter. Outside of keeping a clean kitchen, then, Sweet Shop is very low on challenge. It does try to provide something different with the World Challenge mode, which lets you take on some additional mini-game duties in spin-off shops around the globe. These aren’t as deep as the main event, but they’re a nice change of pace once in a while and a nice target for score-chasers. There’s also a multiplayer option if you want to put up to four cooks in the kitchen for some mini-game fun, and it’s through Download Play, so you can have a pastry-making party even with a single copy of the game — a fantastic feature. So far, the "Sweets" section of Sweet Shop should feel familiar to any longtime Mama fans, but the "Shop" idea is somewhat of a new twist. After you've made a recipe you'll have the option of putting it up for sale in your sweet shop, where you can sell it to customers in exchange for 'tickets', used to unlock costumes and decorations as you play. In theory this should be a fun addition, but in practice it's very, very bland. All the selling side of your sweet shop entails is setting out the goods and then playing what amounts to a game of 'wait-and-click' — customers will wander in dutifully, walk around a few times, and then almost inevitably purchase a pastry, which means you'll have to 'complete the sale' by tapping on them. It would be significantly more engaging if your customers commented on your work, or really did anything other than walk in and wait to be clicked on. The only actual interactions you can have with them is helping them find a particular sweet, or tapping them until they turn red with anger, which we can confirm with absolute certainty never actually results in them leaving the store. They also look terrible — Sweet Shop is otherwise an attractive game, but the customers are almost comically mismatched, made up of blurry, low-res sprites and stumbling around your non-isometric store with an incredibly awkward isometric animation. The shopkeeping is also particularly underwhelming by virtue of its lack of company. 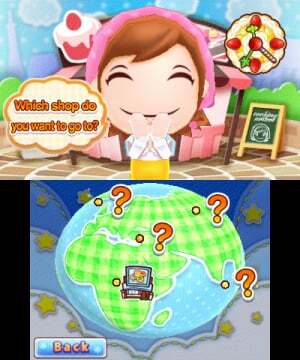 In Cooking Mama 5, if you needed a break from baking you could also pop over to the garden to harvest vegetables, deliver orders in a café, or do some Brain Age-style exercises to keep your mind as sharp as Mama’s knives. In Sweet Shop, your only real options are World Challenge — decently fun — or tending shop, which is so much less fun than being in the kitchen that it’s almost not worth it. That’s not to say that the cooking can’t carry the experience by itself — because it definitely does — but only that Cooking Mama 5 set the bar high on extras and the lack of similar options here is noticeable. Happily, aside from the cumbersome customers, Sweet Shop looks great. While it's not pushing the limits of the system by any means, and everything in Mama's kitchen apart from the subtle stereoscopic effect could be rendered just fine on a DSi, there's a comforting cuteness and colorful style here that's very appealing. Everything's bright and cheery, and the saturated colours, strong lines and chunky models make it feel like a cartoon or toy kitchen brought to life. Most of the game relies on that strong art style to carry a relatively low-poly look, but the food itself, it has to be said, looks genuinely great. The berries on top of our fruit tartlets glistened with a sugary sheen, the cream in our crêpes looked light and fluffy, and cakes looked decadent and moist — Sweet Shop nails the presentation where it counts, and as a mark of the high quality of its modeled delights we frequently felt the pangs of fresh hunger after most play sessions. A special mention also goes to Mama's music, which matches the friendly feel of the visuals with light, Wii-fit style bossa nova, sunny jazz, and a wonderful ragtime band that backs up your baking. Like a classic chocolate cake, Cooking Mama Sweet Shop is comfortingly familiar, dependably tasty, and not about to surprise or delight with any particular twists. It doesn't do much to innovate on the series’ successful recipe of touchscreen microgames and food-based fun, but what's here is solid, and the focus on sweets does play to the series' strengths — even if the 'Shop' side of the equation falls flat. It's also commendably accessible, and backs up its all-ages appeal with simple, easy to read gameplay that's perfect for younger and novice gamers. 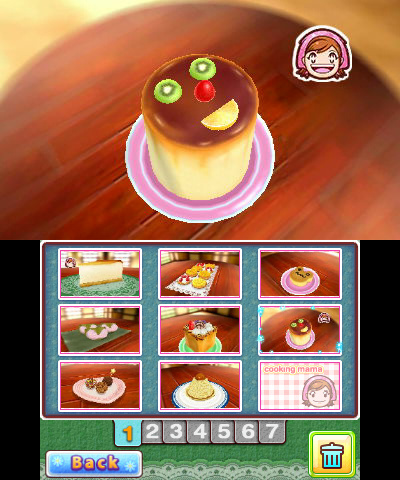 If you're not specifically into desserts, Cooking Mama 5 is still our pick for the better game, but if you're looking to take a baking break with life's sugarier pleasures, Mama's Sweet Shop is a pretty sweet place to be. I love the idea that she is trying to sabotage everything by "flinging" stuff across the room! Bad Cooking Mama! I like the Cooking Mama series but it is too little too late...the Switch beckons. Order Up!! 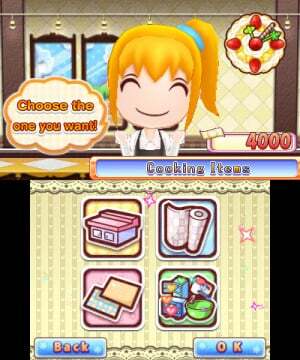 is still the best cooking/restaurant management game. It's a shame it didn't even get one sequel yet this overrated series has loads. This really should have been on Switch. 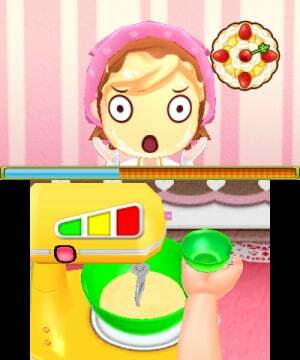 A new Cooking Mama game with HD rumble could potentially be brilliant. Wait, Mama can have Blonde Ponytail hair ?! So, at least I can have different Mama's looking. I will get this game soon, still waiting my order arrived. Nice idea. 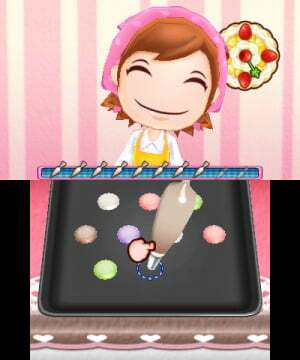 It will be like Cooking Mama Wii, so all the recipes doesn't require Blowing into mic since Joy Cons doesn't have Mic. Mama has so many friends including her family members, so it would be nice if we can use Papa / Ringo (Son) / Ichigo (Daughter) / her friends as Host during gameplay. We have heard so million times "Wow, even better than Mama ! ", so it would be nice if there are some different comments from different characters like "Terrific, Papa is impressed !" or "Wonderful, i'm so impressed !" or "Bravooo...!!!" or "Hey, awesome man !" & etc. 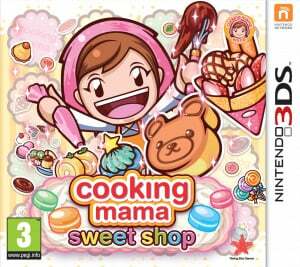 Well, we can dreaming for better Cooking Mama but it seems Office Create want to upgrade their Mama games slowly like Baby step. If Office Create creative enough, the other characters can be used for different games like Workshop / Doctor / Police Papa or Cooking Mama World: Open Business or Boutique / Florist Mama. Oops, too much comments but these are my comments from my deepest heart. Wanna see some improvement from Mama games. i <3 cooking mama. thanks derek. I was thinking more along the lines of the HD rumble being used to simulate a whisk, a food processor, the sensation of food being fried, bubbling, ingredients being poured into pots/pans/cups etc. While we're at it, I would love to see a new WarioWare game that takes full advantage of HD rumble and the superior motion sensitivity of the Joy-Con controllers.